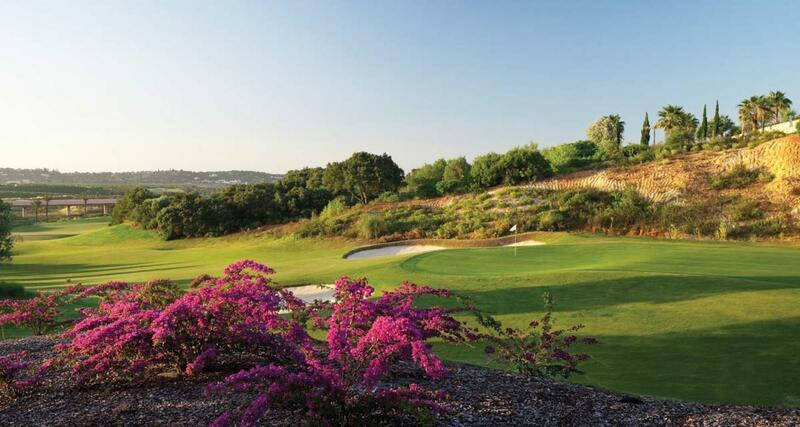 Its two 18-hole championship courses, designed by golfing legends Sir Nick Faldo and the late Christy O’Connor Jnr, nestle seamlessly in an area of outstanding natural beauty in stunning countryside near Alcantarilha. Blessed with world-class resort facilities and a year-round temperate climate, Amendoeira is unquestionably a golfers’ paradise. The resort recently scooped the Best Golf Course in Portugal Award at the prestigious annual World Golf Awards, which rewards excellence in golfing tourism; Portugal itself was named the World’s Best Golf Destination, so there is plenty to celebrate. Owned by the Oceânico Group, Amendoeira is in easy reach of Faro Airport and close to magnificent sandy beaches, charming towns and villages and local culture. Golfers from all over the world and of all levels holiday here or visit from other locations across the Algarve. Lush fairways and greens and a plethora of indigenous trees - almond, carob, cork and olive - flank the gently ascending approach road to the impressive clubhouse and reception, which sits majestically over the Oceânico Faldo and Oceânico O’Connor par 72 courses. 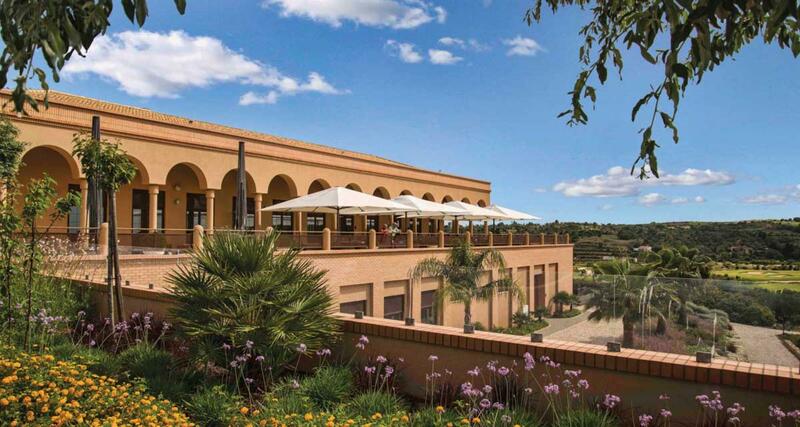 The terracotta tones and arched features of the clubhouse and nearby properties emanate a distinct Moroccan vibe. Much of the architecture has been heavily influenced by Amendoeira’s proximity to the historic town of Silves, the former Moorish capital of the Algarve. All golfers arriving at the resort enjoy a valet check-in service: if you bring your own clubs, simply hand them over to staff on arrival; they will tag your bag and have it delivered directly to a waiting buggy. Tees and water are provided for your game, plus cold towels and club-cleaning at the end. Before and after play, players and visitors can indulge in the clubhouse’s top-class facilities including restaurant, bar and lounge areas, luxurious locker rooms and the Pro-Shop with top-of-the-range brands. The spacious Garden Deck terrace is definitely a place to chill, with incredible panoramic views of the golf courses. Statues of Amendoeira’s famous golf course architects, Faldo and O’Connor Jnr, have been strategically placed near their design triumphs: Britain’s Sir Nick Faldo, six-time major champion and former world number one, stands in a familiar pose overlooking his desert-style course; Ireland’s European Ryder Cup hero Christy O’Connor Jnr welcomes players coming off the 18th hole of his lush oasis. Sir Nick’s eponymous 6958m Oceânico Faldo Course was created by his own Faldo Design team and has been dubbed a strategic masterpiece with memorable challenges for all levels of player. Cacti, wild herbs, ancient native olive trees and desert scrub bunkers spread across the undulating terrain producing an Arizona-type feel. The back nine is quite hilly, but with amazing views. As a perfect complement to the Faldo course, the 6708m Oceânico O’Connor Course, with its wider, flatter fairways and big greens, lies in a fertile valley planted with orange groves and mature palm trees; the many water hazards spread throughout the course test the accuracy of most golfers. The lakes and streams are maintained as a nature reserve, being home to around 50 bird species. Situated between the two principal courses is Portugal’s only floodlit course: the nine-hole, par three Oceânico Academy Course - perfect for beginners and families or players wanting to improve their short game. 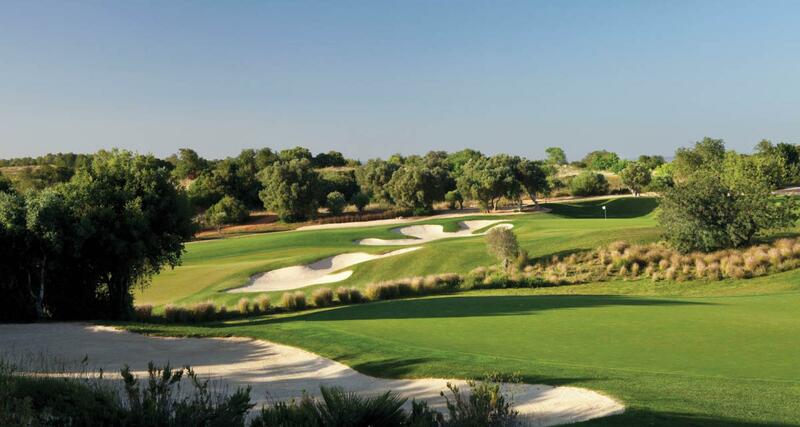 Amendoeira’s practice facilities are among the best in Europe, with putting and chipping greens and short and long-game practice areas, including a Faldo-designed undulated chipping green with bunker and a Scoring V for short-game strategy. A spectacular grass driving range, using top-quality NXT Tour S high-performance balls, is maintained to the highest standard. Lessons for all levels of player, including juniors, are available at the Amendoeira Golf Academy, headed by resort Professional Nelson Cavalheiro. A V1 computer coaching analysis system and Trackman performance-enhancing software are used alongside traditional teaching methods.